Steamboat Springs, situated within the Northwest region of Colorado and tucked into the Yampa Valley, provides a heavenly summer and winter-wonderland for the lucky individuals that get to call it home. Steamboat provides an abundance of winter and summer activities, dining, and unique Rocky Mountain attractions. Steamboat also provides a variety of options for homes for sale in Steamboat Springs, CO. Below are what we have categorized as the different types of Real Estate. Looking for a perfect place for you and your family? See how charming life can be in Steamboat. Whether you are looking for wood floors, stainless steel appliances, main level master, or granite countertops, The Vanatta Group can help you find a home that perfectly captures the essence of life in Steamboat Springs. Don’t miss this Steamboat Springs Real Estate listing for this Single Family home. Townhomes are part of the offering in Steamboat as well! Traditionally, a townhome is a modern home offered with a smaller footprint on multiple levels. Surprisingly enough, townhomes were originally owned by wealthy city dwellers, who owned a house in the country that they lived in most of the year. We have luxury townhomes in Steamboat Springs that provide a unique living experience in the Yampa Valley. This incredible townhome is at the top of a cul-de-sac and features a complete remodeling that will leave you breathless! Anderson Kenny of New York was the lead in this remodeling job, and you can see his work in every aspect of the home. Each bedroom has its own bath, there are custom kitchen cabinets that stretch to the ceiling, includes a walk-in pantry and incredible stained wood floors. This is one you have to see to believe, and also dramatically alters anyone’s viewpoint of Steamboat being just a “ski lodge” town. Condos are very popular in a ski town, for fairly obvious reasons. A condo is a form of housing or real estate, in which a specific portion of the realty property is owned by an individual. Our condos can range from the typical multiple bedroom family home, vacation type rental home, all the way to larger penthouse style condos. If you are looking for condos, make sure to take a look at this listing. Looking for an abundance of space and luxury? Consider an estate, perhaps even a mountain estate, with houses and outbuilding on very large pieces of property in Northwest Colorado. This can potentially encompass multiple farms, or large amounts of farm land. Imagine a 10,000 square foot property, between 100-200 square feet, ponds, camping cabins, hot tubs, and more, all within arguably one of the most beautiful places in Colorado. 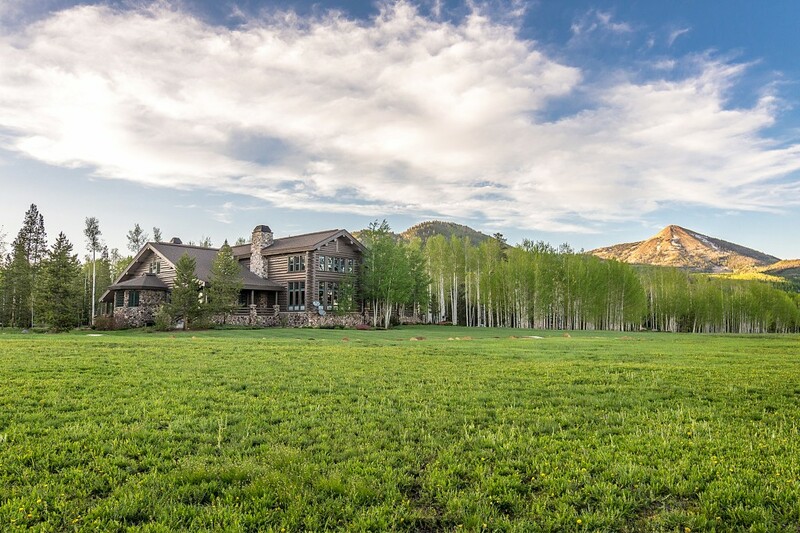 Here is a perfect example of an Estate in Steamboat Springs, CO.
For some, Ski-in/Ski-Out is a must for some people looking for property in Steamboat Springs, CO. This means that your property is situated in a location where you can easily access the mountain straight from your property. Walk out your door, throw on your skis, and easily access the mountain for a day of glorious downhill turns. We provide some of the ultimate Ski-in/Ski-Out properties, where you have direct access to the mountain right out your back patio. Make sure to check out this ultimate Ski-in/Ski-out Edgemont property here. The Sanctuary in Steamboat Springs is one of the more prestigious luxury neighborhoods in the area, and continues to prove why this town is growing in popularity. It is located not far from both downtown Steamboat and the ski resort regions. What makes this location even more popular is the cross country skiing and golf that are located right outside your door. This home is one of our current sanctuary homes on the market. Pam Vanatta has a lot of experience with the Sanctuary homes, take a look at one of her current Sanctuary Real Estate listings here. Steamboat Springs is also home to some of the most majestic homes that can only be described simply as “breathtaking”; stunning homes that sit on anywhere from half-acre to over a hundred acres, where bedrooms and baths are plentiful, and you couldn’t ask for more gorgeous homes. Every detail of these homes have been meticulously thought out, including all the finishes, hand crafted cabinets, doors, and route iron banisters to ultimate breathtaking design. Whether you are looking for a full movie theater, massive fireplaces, a perfect home for entertaining guests, having parties or just enjoying the peaceful mountains and views in Steamboat, we will surely be able to find something that fits your style. Could this be the luxury home for you? Log cabins and homes are reminiscent of a different time and place, and fit in perfectly all throughout Steamboat Springs. We often have lots of log cabins available on our site, and they are a perfect choice for everyone from local skiing enthusiasts, to families looking to settle in the area. Log cabins offer a rustic look and blend in very well with the natural look of this beautiful Rocky Mountain region. Don’t miss our current listing for this log home for sale in Steamboat. Space is plentiful in Steamboat Springs, especially if you are considering purchasing a ranch. A ranch provides a living estate on either farming land or a mountain landscape, which includes multiple structures primarily focused towards farming or ranching. Although there is not a minimum amount of space that qualifies a property as a ranch, typically you will see ranches in Steamboat with breathtaking acreage and views. We can thank the settlers, ranches and homesteaders for making Northwest Colorado such a large ranching community ever since the early 1900s. The heritage still very present in the community today. Nothing compares to looking out the windows of your home with nothing but soft blankets of snow covering the earth during one of the glorious 3 wire winters. Click to view this Colorado Ranch for sale. No matter what it is you are looking for, Steamboat Estates has all the luxury log homes/mansions, quaint cabins, family homes, townhomes and condos you could ask for. We look forward to talking to you about Steamboat Springs, as well as helping you find the perfect home for you and your family. © 2017 Pam Vanatta. All rights reserved | Sitemap | Design by Agent Image - Real Estate Web Design.